I cannot be easily placed in any category. Over time I have become a multi dimensional artist of various art forms. I am a plein air paintera French term used by painters for painting out of doors, like the French Impressionists of light and color which is the essence of my work. I am inspired to continuously learn to see the constant metamorphous in color differences between the light and shadow areas. Light and color are just as important in my photography as well as abstract painting. I combine my curiosity and imagination to create three dimensional assemblagea sculpture or collage consisting of an arrangement of miscellaneous objects such as scraps of metal, cloth, paper, rope, etc. using found objects, as well as beaded jewelry with unusual beads and crystals, and hand-paint fanciful furniture, clothing and t-shirts. Sharing my artistic abilities is a way of life; guiding children & their spontaneity & discovery of self, adults searching for new creative endeavors, and the empowerment of seniors, making art to remember their past or images of the present. The evolution of my art is like life, an ongoing process. Jaynes and Winter's goals were to honor older women in our society, to unite and bring about the best of aging, living alone, and to validate their wisdom, courage and beauty. But most importantly, to make their stories available to others. The feedback from this humble little book has been tremendous and rewarding. Many older women have said how much they appreciate such a book, that there is very little available to validate and show the stories of older women in our society. 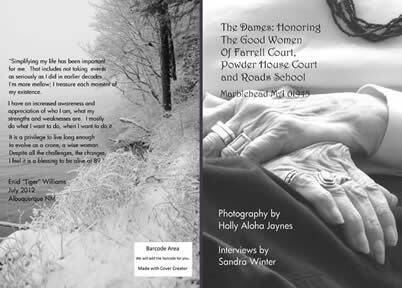 Together, Jaynes photographed women ages 70-100 who self selected for the Dames Project and Winter intervied and edited hours of tapes from each woman to make this book, Winter's dream, a reality. Jaynes and Winter wanted this project to be intergenerational and invited students from the Marblehead Public Community Charter School to particitpate, for their spring enrichment program. The students made a scrapbook featuring five of the women, a six foot time line of a 94 year old and a video of those they interviewed, which was shown at the opening, The photographs enlarged to 12x20. The Dames were the Guests of Honor. This project was made possible by a grant from the Marblehead/Massachusetts Cultural Council and a Fundraiser by Jaynes and Winter, "Fan The Flames For The Dames". 250 copies were printed and donated to senior centers, senior services, schools, doctor's offices and libraries. And of course, to the Dames, and thier families, who made this book possible, we owe our deepest gratitude.